Metal Injection Molding (MIM) an advanced metal forming process that allows complex parts to be shaped in a single operation and in high volume—a perfect solution for creating small, complex metal components. Although metal injection molding can be utilized across a wide range of components, the best applications are typically small in overall size and less than 100 grams in weight. 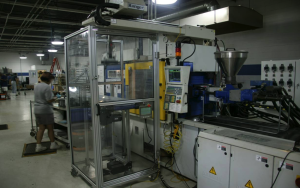 It is sometimes referred to as Powdered Injection Molding (PIM). Any finely-tuned operation requires strict adherence to a process. To create MIM parts, we follow 5 basic steps. This metallurgy technique involves mixing finely-powdered metal with a carefully selected and measured amount of binder material (polymer) to comprise a “feedstock.” This blending and extruding process is very tightly controlled to produce a top-quality final product. This feedstock then goes to molding presses equipped with robotic part handlers, which allows for production of a broad range of shapes and complexities using many different alloys. From there, MIM parts are transferred and immersed into water to remove approximately two-thirds of the binder. Parts are then dried to limit the amount of water present for the next step in the process—sintering, which is performed in a hydrogen/nitrogen atmosphere. The pusher furnaces provide excellent throughput and high-temperature capability. After sintering, any secondary operations are employed to create your finished metal injection part to your exact specifications. Every metal injection production run is quality monitored to ensure you receive your parts just as you ordered. The inspection process uses a multitude of techniques and equipment, including an alloy analyzer, optical comparator, Optical Gaging Products (OGP), automated inspections, and mechanical testing. Many MIM parts are higher volume parts used in the Medical and Firearms industries. The cost benefit is realized once tooling is owned through a dramatic reduction in the piece pricing. MIM materials include all standard alloys, plus application-specific alloys upon request. 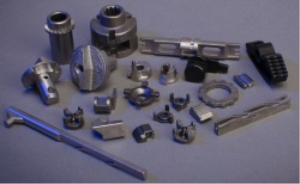 As part of our MIM process, we offer low-cost prototyping, an experienced process and metallurgical team, and tool transfers from other metal injection producers. We are ISO 9001:2008 certified and support JIT and Kanban programs. MIM is one of the many ways CSI can provide 1 source solutions for you. With 30 years of experience and valued partners, all leaders in the high-precision component manufacturing segment, we can easily delivery the customized parts and components best suited for you. Our experienced engineering team is ready to work with you to find the best 1 source solution for your needs. Contact Us to get the conversation started.